Who doesn't love a no-bake recipe. Especially one that calls for chocolate! Try this simple recipe for your Valentine and make it seem like your spent hours in the kitchen. 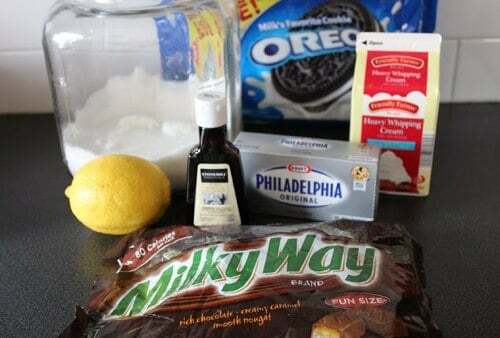 Beat together cream cheese, lemon juice, vanilla and sugar until creamy. In a large bowl whip the heavy cream until peaks form. Fold 2/3 of whipped cream into cream cheese mixture. Tranfer to the corner a large zippered bag and cut off corner for piping into jars. Melt butter and add to crushed graham crackers. Place a layer of crushed Oreos in the bottom of each jar and tamp down. 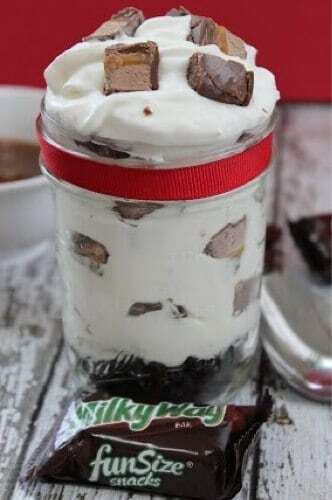 Pipe in cheese cake mixture into each jar. Gently tap jar to get mixture to settle and level. Wipe down any streaks above the level of the mixture with damp paper towel. Transfer the remaining whipped cream to the corner a large zippered bag and cut off corner for piping into jars. Pipe a layer of whipped cream into each jar. 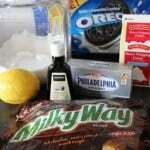 Insert a couple of the candy pieces into the whipped cream as a garnish.